Did the mining of Haiti’s riches since 2004 GW Bush regime change cause the earthquake? Listen to Marguerite Laurent, known as Ezili Dantò, on mining Haiti’s riches and concern for environmental degradation by the foreign companies. Since the earthquake, I’ve had occasion to ponder, like many others, about what may have caused this heretofore-unknown natural disaster in Haiti? Was it a natural occurrence or man-made? Haiti has not had an earthquake in 270 years. Why now? The nation of Haiti is only 206 years old, so Haitians have no experience with earthquakes whatsoever. They did not know that for an earthquake you run away from the house. So, when the trembling started they did the worst possible thing—ran into their houses as they are used to, for protection, with hurricanes. The houses all collapsed on them. How could this devastation happen? 200,000 dead in the capital alone, devastation in the South also, in Leogane, Les Cayes, Jacmel. In Port Au Prince everything collapse, 400,000 to be relocated, millions homeless, untold numbers with amputated limbs, hundreds of thousands right now dying without access to water, food, shelter and medical treatment. Since the 2004 Bush Regime change Ezili’s Haitian Lawyers Leadership Network (HLLN) has been concerned about the digging up of Haiti without any regards to environmental degradation. We’ve had severe hurricanes in 2004, 2005 and then the four back-to-back hurricanes of 2008. The people’s living conditions has not improved in the 6-years the U.S., France and Canada have controlled Haiti through the U.N. proxy occupation. In fact, with clorox hunger, food riots, no money to send children to school, high food and fuel prices, no development in the 6-years the UN/US has been directly controlling Haiti, things, had gotten much worse since the coup against President Aristide. The people were simply slowly dying as UN Special Envoy Bill Clinton waxed on about the “good business climate” in Haiti prior to the earthquake. They died and there was no rebuilding of the institutions the Bush coup d’etat had helped destroy. But there were 9,000 UN troops in Haiti doing what? In the Mining Haiti’s Riches interview, I recount how there were areas in Haiti hidden behind UN guns, fenced off where Haitians knew nothing about what these soldiers were doing. Then the earthquake hit. What remains is unimaginable. The rescue and recovery process was inhumane. The relief from pain and hunger is still not in place. And, as I think about the process of rebuilding, I started checking whether digging for gold, iridium, copper, uranium, diamonds and oil could trigger an earthquake. And the answer I found sent chills up my spine. Made me sick to my stomach. Can this really be? From what I’ve read, drilling deep into the earth digging and mining may trigger earthquakes. And, drilling either for fossil fuels or renewable energy exploration may cause earthquakes. Both geophysicists and oilmen agree that natural-gas drilling trigger earthquakes. One oilman stated that “there is not the slightest doubt” that gas production caused the temblors.” (See, At Fault: Does Drilling Cause Earthquakes?). According to a New York Times report drilling for oil sets off earthquakes. A drilling project near San Francisco and a similar project in Basel, Switzerland were shut down over concerns they trigger damaging earthquakes. Both diggings involved fracturing hard rock more than two miles deep. Was that the reason for the US delay in getting to the survivors? Was there more pressing concerns of cover-up to attend to before the modern world and the all-seeing cameras headed to haiti, got to Haiti? What were the thousands upon thousands of UN soldiers, from the 9,000 in Haiti, posted outside of Port-au-Prince doing that they did not appear on the scene to help with the rescue? Where were they? These soldiers get paid and tell all and sundry they are in Haiti to “help” Haitians and have been paid billions of dollars in five years, over $600 million per year for the “help.” Where was this help? 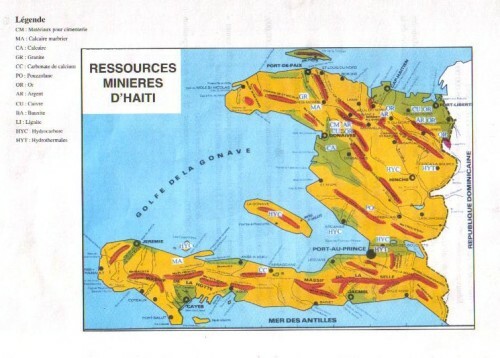 A map showing the mining resources in Haiti shows five oil/gas sites in Haiti. Notice how most of the Haiti oil is located at and around the waters, land, and on the island and shores of the Gulf of La Gonave, Port au Prince where perhaps there was drilling before earthquake? Recently the President of France asked Haiti for a long-term lease to the Island of La Gonave. It was at a secret meeting in Ottawa, in 2003, where foreign officials from the OAS, France, Canada and the United States initiated the planning for military ouster of democratically elected Haiti President, Jean Bertrand Aristide. The idea that human activity can cause seismic activity is widely accepted in the scientific community …the connection between oil production and earthquakes dates back to at least the 1920s, when geologists in South Texas noted faulting near the Goose Creek oil field…A 1967 human-triggered earthquake in western India linked to the Koyna Dam registered a 7.0 earthquake. It seems clear, since the earthquake, that Haitian life is not as valuable as securing the corporatocracy, foreign life and interest in Haiti’s soil and mineral resources. A pharmaceutical company was excavating a microbe discovered in Haitian soil that would be used to develop super-antibiotic drug. Up in the North the Canadians were digging gold, granite, chalk. No one knows how many Haitian earthquake victims could have lived or been rescued from under the rubble if emergency first responders – airplane loads of them, filled with doctors, field hospitals, water, food, medical supplies, were not turned back and prevented by the US from landing” We know people died unnecessarily and are still dying. It seems that what the US is doing is securing the land for itself, preferably without the presence of black Haitians. Cuba in a few more years? Neither barren nor lifeless as hysterical news stories claim! In fact, before the earthquake, the former president of the Dominican Petroleum Refinery (REFIDOMSA), Leopoldo Espaillat Nanita, even said, “there is a multinational conspiracy to illegally take the mineral resources of the Haitian people. A pharmaceutical company was excavating a microbe discovered in Haitian soil that would be used to develop super-antibiotic drug. Since the earthquake Haiti children are disappearing, more so than before in UN occupied Haiti where they routinely got raped and/or molested by either charity workers or UN soldiers. For, child traffickers activated immediately to take advantage of the earthquake chaos. There’s a report that fifteen children simply disappeared from a hospital. There’s no prioritizing security for fragile and wounded Haitian children. We know the digging of Haiti’s mountains that is going on in the North of Haiti, if not the drilling for oil we suspect that is also happening, may have triggered this massive holocaust in Haiti. But the US has no remorse. France and Canada have no accountability for orchestrating the regime change that disenfranchised Haiti’s people in order to plunder Haiti. No. Rumor has it, as the capital area is being depopulated, as the people suffer and die, France, US and Canada are haggling over divvying up “zones of protection” so they can help Haitians some more. Canada wants the North of Haiti. The US wants Port-au-Prince and the Island of La Gonave and is willing to give France something, how about Jacmel in the South? It’s artistic! France ain’t hearing it. France wants the oil rich Island of La Gonave. The tussle even made it on the public stage because since France isn’t getting the part of Haiti it wants, it accused the US of occupying Haiti. Something must have been resolved because France soon retracted. China, the sleeping giant with UN veto power, is a problem for all of them, because it wants to know, what is its share? Meanwhile Haitians continue to be helped to suffer and die to accommodate. If drilling caused the earthquake, how did US and UN personell with equipment manage to be in Haiti in such a short time? Compare this to the situation before, during and after hurricane Katrina hit the coastline. Are Haiti's children being flown out to paedophiliacs with the knowledge and help of the UN and USA? 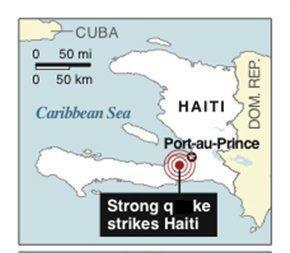 BIG OIL BEHIND HAITI QUAKE? I think so. In some ways it affected the earthquake. Taking care of our natural resources can help us prevent such a natural disaster. the suspicion that the deadly earthquake of 2010 had some reason in petrol and gas exploration is the hard truth. The dirty open secret of the petrol and gas drilling is that the “nuclear fracturing” comes before “hydraulic” suckiung out the minerals. The series of huge nuclear exploison within the adjacent rock formation cause a “crushed zone” and “damaged zone” within the area containing the fuel minerals. After nuclear demolition, water with some chemicals and fine quarz sand is pressed into this “crushed” and “damaged” rock to press out the oil and gas droplets. The on-surface impact of this civil nuclear method could be obsevered by the demolition of WTC1, WTC2 and WTC7 in New York at 11. September 2001. It is not really a secret for people who look back on available historic documents. Nothing is hidden from eyes and ears, but only veiled from minds! Connecting #911 with #Fracking by #Radioactivity! It is time for the humanity to wake up and stop this criminal global gang.